It's no secret that many shoe styles from decades past resurface, and jelly shoes are no exception. If you loved the look of jelly shoes in the 1980s, you're in for a treat. You'll find an array of looks in today's hottest styles and colors, including new, more comfortable materials and fresh takes on this 80s-inspired shoe. You'll find styles for girls, women, and even men. In most cases, jelly shoes were flat. However, in some cases they did have thick, clunky heels in a matching color. The heels were usually low, maxing out at around two inches. Colors ranged from the classic black or white, to pastels or neon colors with glitter. If you look at the assortment of flip-flops today, you can get a feel for the selection of colors available for jelly shoes in the 1980s. In addition to being colorful, they were cheap. These shoes got their name from the product they were made from: jelly rubber, a type of porous PVC rubber. The material didn't feel much like jelly at all. In fact, they were quite hard and could be uncomfortable with extended wear. In some styles, the straps rubbed and caused blisters if you weren't careful. If your feet got wet or sweaty, they'd slide around in the shoe, exacerbating blister formation. Today, the jelly has made a big comeback and is available in styles ranging from the classic flat to fun sandals to more sophisticated heels. Along with department and discount store footwear, plenty of high-end designers have catered to the craving for 80s-inspired shoes. Designers who have re-invented the jelly include Diane Von Furstenberg, Michael Kors, Kate Spade, Vivienne Westwood and Gucci. Although they aren't nearly as easy to find as women's jelly shoes, there are even some men's styles available, including casual loafer styles and sandals. Advances in plastics and synthetic materials mean huge improvements in jellies from years past. Modern materials are lightweight, offer more comfort, are sweat and odor-resistance, and are surprisingly eco-friendly. Many modern styles of these shoes are made from recycled materials, making them a choice that is environmentally responsible as well as affordable. Although there is a variety of dressier styles, the majority of jelly footwear is more on the casual end. Fun flats, sandals, and thongs are the perfect summer companion for shorts, tees, tank tops, casual skirts and pretty summer dresses. Colors run the gamut from clear to deep red, with plenty of bright hues in the mix. The brighter colors or tinted clear styles work well in spring and summer with almost any casual wear. Darker hues, metallic styles, and dress-up styles like heels, gladiator flats, and embellished wedges can work with more sophisticated outfits too. Pair pretty dresses and skirts with a metallic sandal style, or spice up your skinny jeans with a dark peep toe jelly flat. Choose a fun heel or wedge jelly style to wear with khakis, jeans, or slacks. Choose a fun or funky blouse to keep an interesting vibe. You can shop for jelly shoes in department stores, especially in the spring and summer season when they are most popular. You can also find them at a number of online retailers. One of the top names in jellies is Melissa. This innovative company offers a huge range of women's shoe styles in their patented Melflex material that is light years ahead of the 80s jellies in aesthetics and comfort. Melissa shoes also works with top designers like Vivienne Westwood for glamorous and creative styles. Grendha, who first entered the market in 1982 with their plastic footwear, offers a collection of fresh, modern looks for women and girls. The Brazilian company offers an easy-to-browse online catalogue. 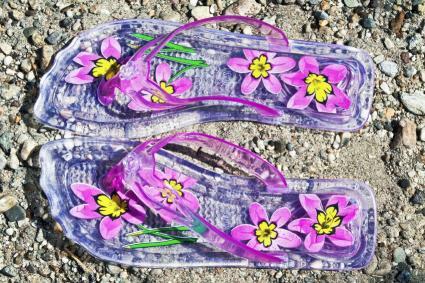 Styles range from simple thongs to more detailed shoe styles with modern details. Cesare Paciotti: This couture shoe and accessory designer, whose designs are available for purchase as Zappos, offers select jelly designs for women and men. Holly Shoes, available at yes Style, offers jelly flats, wedges, and sandals. Chinese Laundry, available at major department stores like Nordstrom's, offers unique, fashion forward jelly flats. Skechers, available at Kohl's, sell trendy, casual jellies for women and girls. Other brands that may includes jellies in their collections and are available at major department stores include Steve Madden, BCBGMAXAZRIA, Missoni, Stuart Weitzman, Nine West and Burberry. Whether you choose a simple jelly shoe whose style evokes the 80s or one of the contemporary styles in plastic footwear, these fun fashion shoes deserve a place in your closet. Available in many more options today than in the past, this unique shoe has plenty of appeal for women who like to add flair to their footwear wardrobe.